A picture dictionary that helps you remember! This book offers a simple effecrive way to learn over 130 key words using the tried-and-tested 'look, cover and speak' method. Key words with picture cues on one page, humorous scenes with short sentences on the other. You can practise speaking or writing the French words over-and-over again using the two wipe-clean flaps to cover the words or the pictures. "Look, cover, say (or write down)"
Left hand page with large picture has simple sentences illustrating usage. for "look, cover and speak". We have selected this as the ideal first French dictionary, offering detailed coverage of core vocabulary in a clear, easy-to-use format. 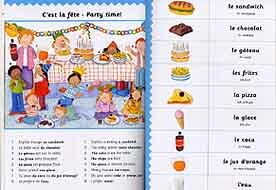 The dictionary has been designed specifically to meet the needs of children learning French, especially at primary school (Key Stage 2). The clear layout introduces young beginners to the key principles they will later meet in more advanced bilingual dictionaries, so they can develop early skills of looking up words they don't know. Core vocabulary is covered in detail with simple examples to illustrate usage, key phrases, cultural information and carefully selected illustrations. This dictionary has been designed not only to appeal to children and their parents, but should also be useful for teachers who may be faced with the challenge of teaching French for the first time. language-notes on key phrases, and age-appropriate cultural information. Buy dictionaries when you order an EARLY START Language Course pack, and save with our ceiling on postage costs. 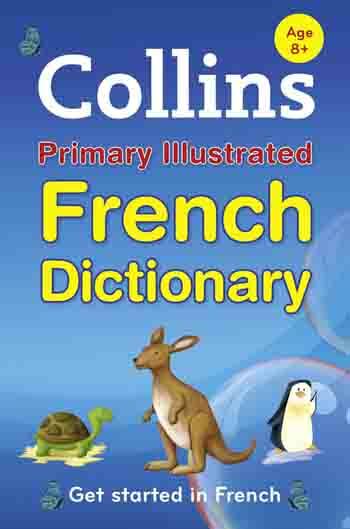 Add 'Collins French Dictionary' - with number required - using the 'Add to Basket' buttons on this page.